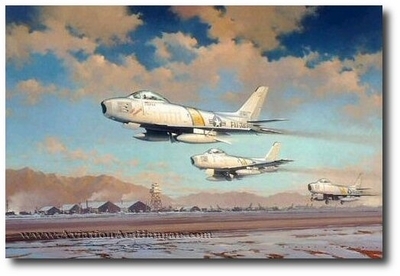 Overall size: 32" x 24"
Image size: 25 3/8" x 17"
The second in his Classic Jet Fighter series, featuring the legendary F-86 Sabre Jet. The frosty morning air is shattered by a "hunting party" of F-86 Sabres of the U.S. 51st Fighter-Interceptor Wing, as they blast off the runway at Kimpo airfield, South Korea. Led by Gabby Gabreski, they are headed north to the Yalu River, and Mig Alley.